Home Features PowerShell SharePoint SharePoint 2010 SharePoint 2013 SharePoint 2016 How to Activate Publishing Feature using PowerShell in SharePoint? How to Activate Publishing Feature using PowerShell in SharePoint? Activating Publishing feature through web user interface resulted in error! Bulk activating publishing feature for all site collections and sites in a web application. Click on "Activate" button next to "SharePoint Server Publishing Infrastructure"
Here is the PowerShell to activate publishing feature at site collection. Enable-SPFeature -Identity "PublishingSite" -url "http://intranet.crescent.com"
We have to activate the Publishing feature at site level also. 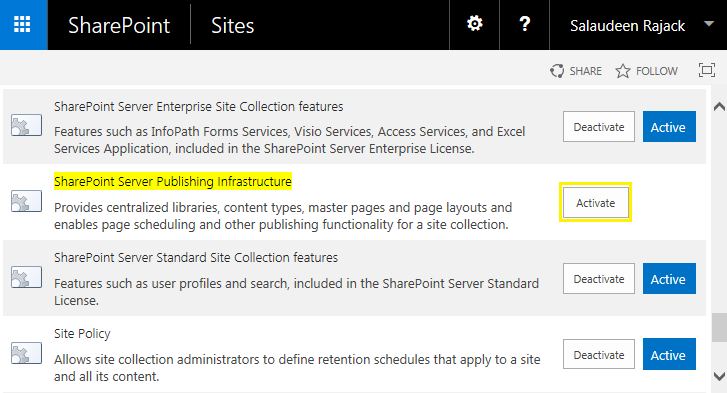 Click on Activate button next to "SharePoint Server Publishing"
Publishing feature must be enabled at site collection before enabling it to sub-sites!